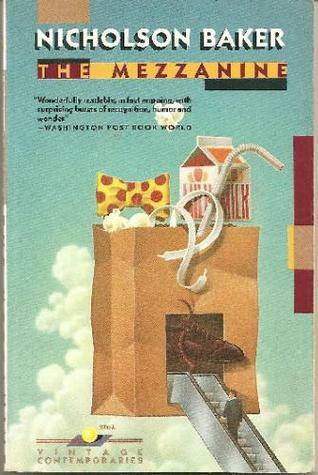 The Mezzanine, Nicholson Baker, Vintage Contemporaries, 1990 (c1988), 135pp. Imagine Andy Rooney writing a novel, and you might come close to what this book by Nicholson Baker resembles. Because nothing really happens here. The protagonist goes to lunch to buy some shoelaces and returns, riding up to his office on the mezzanine level on the escalator. All of that (uhm, what there was of it) is just an excuse for a wide range of introspective discussion about modern life. The strange thing is that this “novel” is readable, and when it touches on some common aspects of human experience, it is downright disarming. Take, for example, the description of the corporate washroom. Within a few pages Baker merges the history of paper towels and the human psychology of the urinal (most specifically, the difficult task of starting with a co-worker nearby). And, truly, I don’t think I will ever be able to ride an escalator again without thinking of this book. In this case, and in several others, Baker turns the minutia of daily life into objects of great meaning. But the sum of all that piggling over detail does not quite congeal. I got the feeling that Baker wanted to make a statement in the end– possibly about how lives are made up of those silly little details and not the heroic exploits found in novels. Nice sentiment. Needs work.